As far as I can tell, this is correct, but since I don't own any type of Holley, I figure you guys would know better than I. From what I gather there are several versions of the Holley NH, one is the older version, the "Side Drain" which I think covers from 1915 to 1917. Then there's the typical Holley NH that has the center drain, from 1920 to 1925. And finally the Holley NH Vaporizer, which has only from the bowl down in common with the previous models. I have no idea what a Vaporizer Holley looks like, can't find one to see where all the strange looking parts I've seen in the catalogs go. First think first though, Holley NH Side Drain...am I close or is there something I missed, please let me know. Your depiction of the upper body is flawed. The carbs with side drain have a straight thru venturi, not dipped as in your drawing. The one "straight through" NH I have is a side drain. I do believe I have others that are side drains but are not "straight through's". 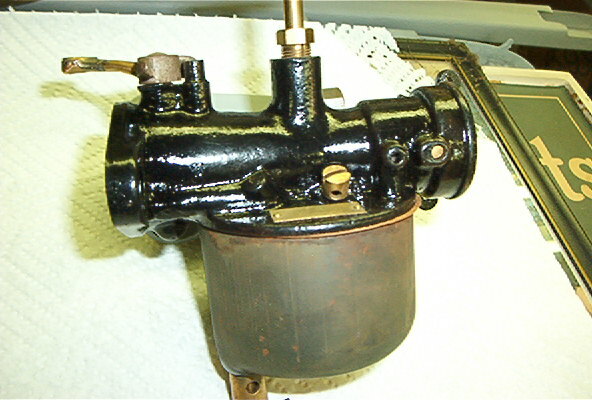 The part of the cast iron carb body where the bowl retainer (P/N 6211) screws in has no notches in it on the side drain versions; two in the center drain. I'm thinking the later versions of NH's did not have the u-shaped wire to hold the choke & throttle butterflys in. The butterflys themselves were deformed with some retaining tabs. I also think the lever arms changed. Maybe the later ones were shorter? I've got about 10 of these carburetors apart right now and have at least noted these differences. There were progressive changes to the NH as Ford and Holley discovered ways to make them quicker, cheaper, and better. 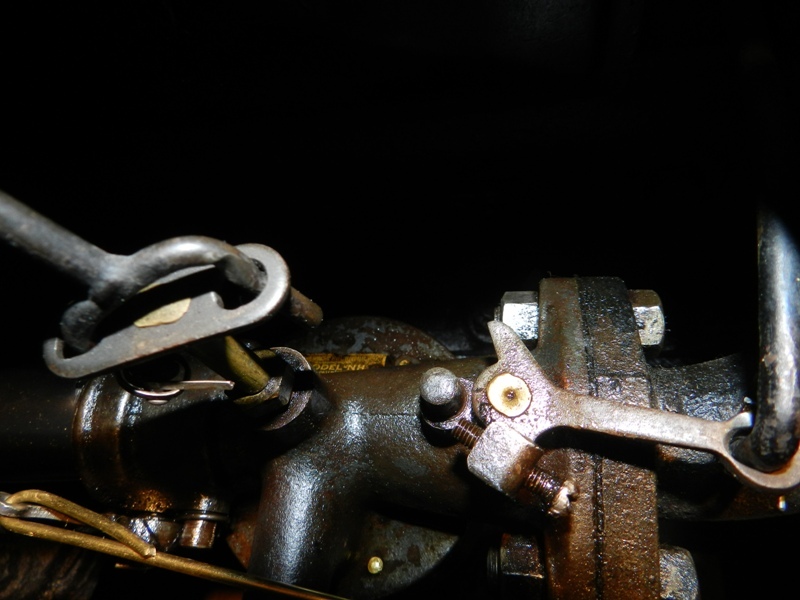 The carburetor above has an original throttle arm which is longer than later ones. Original arms on the early NH were cast metal, distinguishable from the later pressed metal. There is no gasket under T-6208. The early versions of carb have a vent machine bolt in addition to the vent under Data plate. I am going to clean my carburetor this afternoon. Does anyone have photos of the internal passages? Some on the forum have suggested that my lack of power going up hills is do to fuel / carburetor problems. How difficult is it to remove the steel plug that they talk about? Jack, what does the vent machine bolt look like and where does it go? Royce, thank you for your input, I didn't relize that there were so many changes to the body itself. The parts houses all carry various forms evolutionary forms of the parts...but as for the body...I went with what I had found and figured it was based upon the Model F. Do you know what the Vaporizer body looks like? I think it's totally different, but as of yet I've had no luck in finding one to look at. I've made the recommended changes, removed the gasket under the needles nut, elongated the arms on the choke, raised the needle body section to meet the fuel line entry. If I've still missed the mark, please let me know and I'll make the necessary changes. Thank you all again for your input, I really appreciate your help. I see some typos for you. "Snyders P/N's of top, Langs P/N's on the bottom" should be "Snyder's P/N's on top, Lang's P/N's on the bottom"
Like I should be the one to say anything considering all my tipoos. LOL, Thanks Tod, it's hard to see your own mistakes no matter how many times you reread them. Always helps to have other sets of eyes on things to proof reader. Martin,here is see-thru with vent. Jack, thank you for posting this picture, is there a parts house number for that vent? If there is I couldn't find one. Plus your picture is a lot clearer than Royce's was, I can see now plainly what he was talking about with regards to the choke side of the body. I don't think anyone is repoping that vent. Hey Jack, is the vent hole in a different location or is the tag smaller? The later versions just had a hole and the tag covered it. In your picture it looks like a smaller tag but it hard to tell from the angle. I've noticed that the side drain carbs that are being offered by both Langs and Mac's are rebuilt using the later (20-25) body rather than the early style. I've found some pictures of a Vaporizer carb...what a bloody Clooge that is! Does anybody know where that curly little spring like piece called the "heater coil" go inside that thing? I read the advertising lit. and it talks about how that plate gets to 600� pretty soon after you start the car...isn't that a problem...wouldn't that really thin metal burn through fairly quickly? Maybe they should make it out of something a little more durable, say like titanium...it's work hardens in extreme heat yes, but it damn sure wouldn't burn a hole through it. Newest correction, float valve and it's alternate viton tipped component. Ken, the data plate is same size. If you look just to the right on my picture,you can see the bowl vent normally on all the Hollies. The machine screw vent is extra.They normally are found on the early See-thru's. 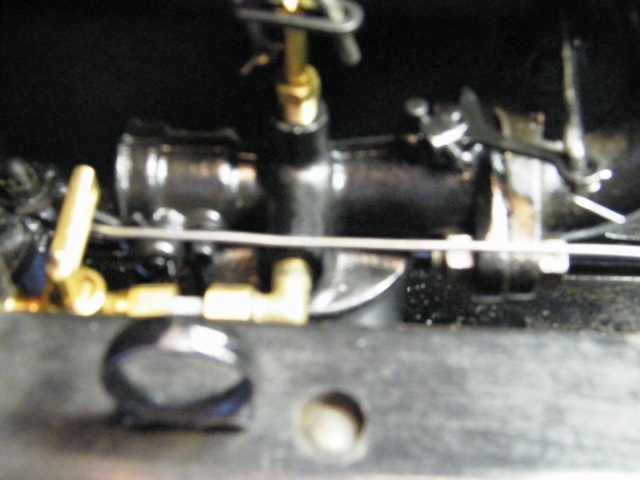 The NH carburetor came out in 1920, and we call it a straight through. Royce is incorrect on the dip carburetor. 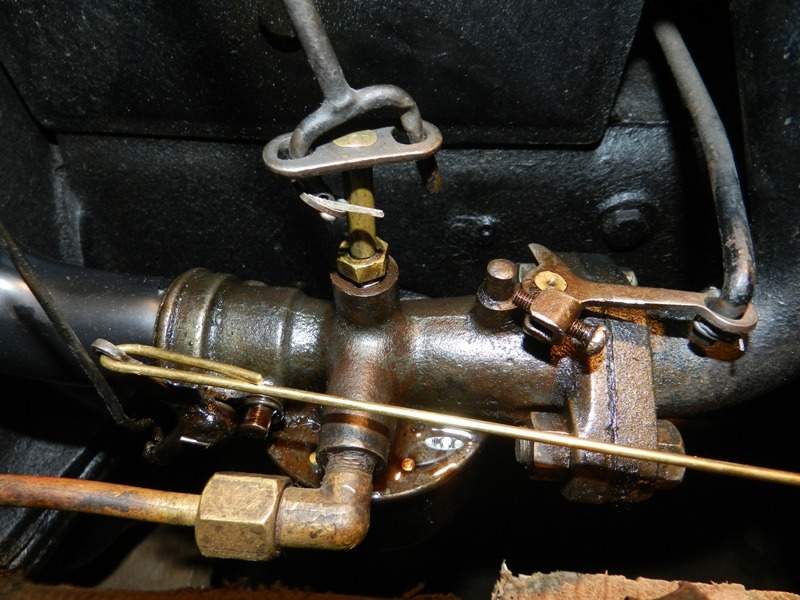 The first dip carburetor did have a side drain. You can tell by no slots at the bottom. I have several of them, and Ford called them a model F. I believe the slots were introduced in 1923, and that is when they went to the center drain. 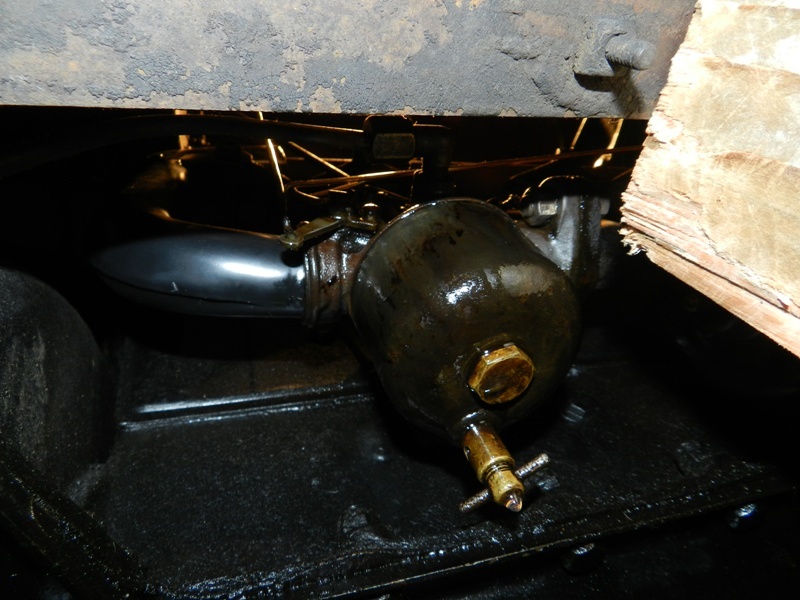 I have a Holley NH Side Drain Carb with the Venturi dips on my Early 1922 Touring. I have a leak and I think its at the bowl gasket but the carb seems to get some gas on top of the carb body too. Anyone have any clues where to look for that leak? I think the Inlet is tight. Look at the wear in the linkages. I checked the bushing in the throttle linkage by moving it from side to side and there is plenty of play. The car seems to idle ok but I am sure it has to be leaking air. 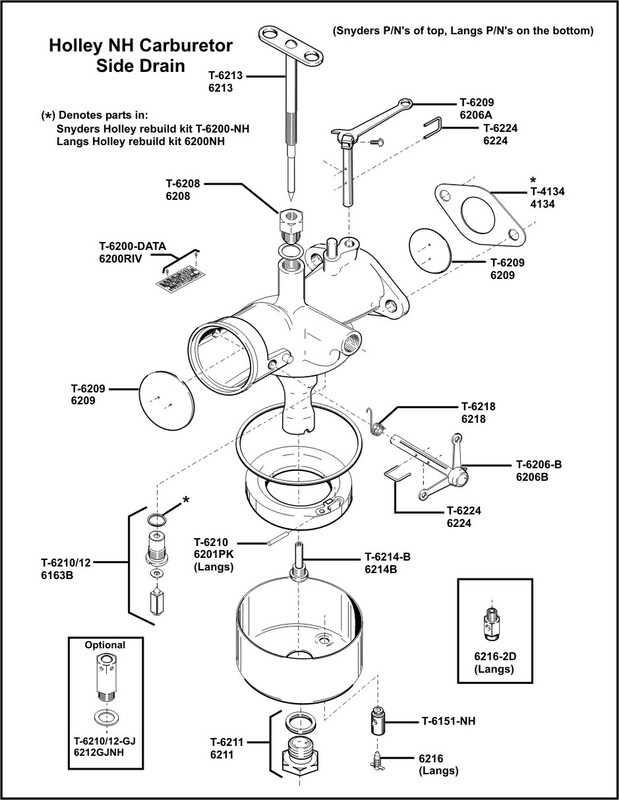 Float level should be 15/64"
Check for dirty inlet valve and/or loose inlet valve in carb body. Blow by thru the engine valve cover will show as wet. I think the Carb is the next Project in line and I am ordering parts as I wait for the Front End supplies to arrive. I ordered everything I need for the NH Carb rebuild but will have to wait until the new throttle shaft arrives in order to know if it will take up the slack in the housing. I might need to put a bushing in if its to loose. What is everyone's recommendation on paint for the Holley NH Carb. I have seen PlastiKote Black Lacquer Carb Paint as an option mentioned. Anyone with experience with this product? I have also seen Powdercoat mentioned too. Is the drain body at the bottom of the bowl, on this side drain carb, soldered in? I thought it would screw out but it looks like there is solder inside the bowl. 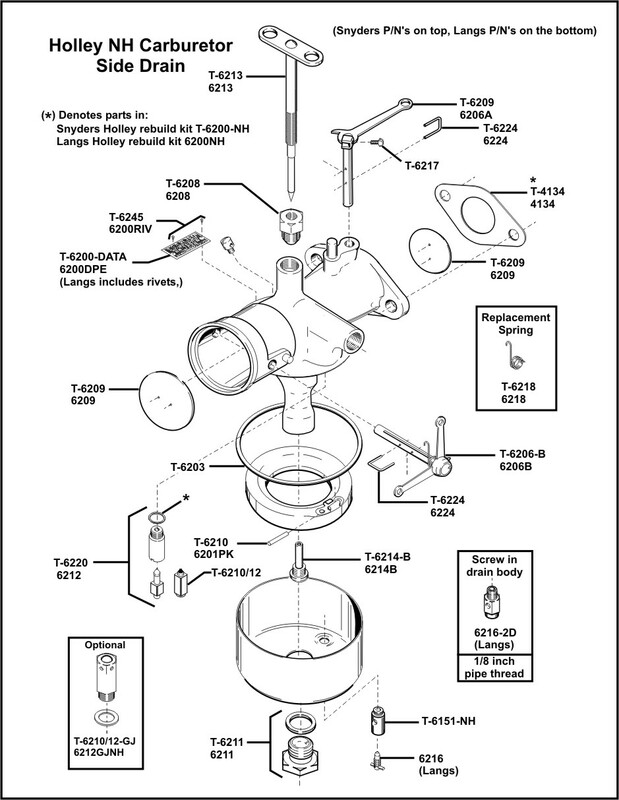 I just got the answer: There is not gasket between the Drain Body and the bottom of the bowl and yes it is soldered in to the bowl. Still need help with a paint that will hold up to gas. It sounds like there is no Spray Can paint that will hold up to puddled gas sitting on it. I am rebuilding this carb hopefully leak free but I want the paint to last if it does happen to leak and sit there over time. I have herd mixed reviews on the POR-15 and gas (Any thoughts here) what do people say about Powder Coating. What other alternatives are there if you don't have a spray booth and gun equipment to do a proper two part? Has anyone used Bill Hirsch products? Here is a link to the paint section and some paint that looks to be fuel proof. My NH is painted with Por-15 inside and out. It is not bothered by gas or just about anything else.